For most business-to-business (B2B) companies, generating leads is the top priority for marketing. And if you invest in developing content as part of your marketing plan, you want to make sure you distribute that content as far and wide as possible. LinkedIn has been "the" B2B social media platform since its inception. But with Facebook coming up strong and increasing its B2B focus, we wanted to compare the two platforms when it comes to generating leads. Here's how our test went. There are currently over 546 million LinkedIn members2. Of these, 61 million are senior influencers and 40 million are decision makers3. When you're trying to close a deal, this is the audience that can make it happen. The great news is that 260 million members log in monthly1. Most are actively looking for new content. In an ideal world, you'd have a large network with all your prospects so you could just promote all of your content on your company page and reach everyone organically. But for most people and companies, that isn't realistic. You typically need to look beyond your network to get the exposure you're looking for and the leads you want. There are several ways you can do this, including sponsored content or InMail, or using text ads, dynamic ads and programmatic display ads4. Want to know more about how Facebook Ads compare to Google pay-per-click? Read Facebook Ads or Google Ads: What’s in Your Marketing Plans?). But where does LinkedIn advertising fit in the mix? 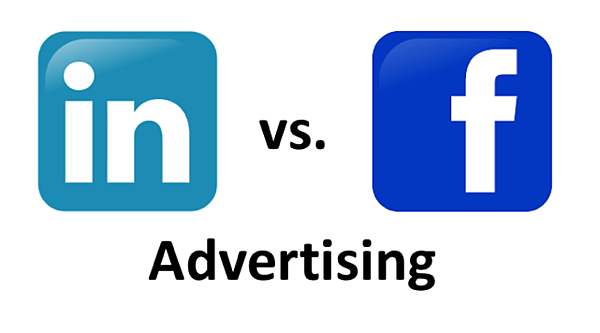 When it comes to generating B2B leads, how does LInkedIn advertising compare to Facebook? That's what we'll cover today. Sponsoring content on LinkedIn is the equivalent of boosting your post on Facebook. LinkedIn sponsored content appears in the news-feed of the target audience you define based on the parameters you set. You can segment your audience by any information that LinkedIn collects such as job title, geography, company size, etc. Then you apply that audience to your post with a budget (you can set the budget daily or for the duration of the campaign). Now your content will appear in the news-feed of your prospects the same way they get their organic content from their network. Facebook advertising is a medium that can be surprisingly effective even in B2B. With over two billion Facebook users, there’s a good chance your prospects are there. Like LinkedIn, you can segment your audience based on any of the data points that Facebook collects like geography, interests and behaviours5. Similar to a sponsored post on LinkedIn, you can boost a post on Facebook. This puts the post into your prospects' timeline along with their organic content. Unlike LinkedIn, it’s important for B2B marketers to realize that you cannot segment by job title or company name as many users on Facebook don’t include that information. So, you need to select other criteria critical to segmentation. Two of the differences to consider are reach and cost. There are over 500 million members on LinkedIn, and over two billion on Facebook. In B2B marketing, we look for quality leads over quantity of leads. But you do need to reach a large audience in order to get results, so audience size is an important consideration. Even today, we know many B2B companies who say that Facebook is only for personal connections - not for business. But that isn't true anymore. There are now 4 million company pages on LinkedIn - compared with 25 million on Facebook6. We decided to run a test to compare the results of LinkedIn and Facebook advertising. We had read the differences as far as ad performance, that the average cost per 1,000 impressions is approximately $2 on LinkedIn vs. $3 on Facebook6. The overall click-through rates of advertising on the social networks is higher on Facebook with 1.5/1,000 users clicking, in comparison to LinkedIn’s 1/1,0006; however, pay-per-click advertising tends to be more successful on LinkedIn with 15/100 users clicking on it, compared to 12/100 on Facebook6. The average cost per click is lower on Facebook at $1-2 compared to $2-7 on LinkedIn6. Most of our clients care about the average cost per lead. While there are a number of factors that influence the cost, in our test (promoting a whitepaper), we found that the average cost per lead was $20 on Facebook compared to $50 on LinkedIn. In short, LinkedIn tends be more expensive. But in our test, we got better quality leads for our B2B client using LinkedIn. It also helped that the client intuitively preferred LinkedIn for their more 'serious' B2B content. A recent survey found that 80% of B2B leads come from LinkedIn compared to only 7% from Facebook2. We continue to use Facebook - both for our own marketing and for our clients - and we do see great results. But if you had to pick just one for B2B lead generation, or if job title or company name is important for your marketing, LinkedIn is your better bet. Additional reading: Facebook Ads or Google Ads: What’s in Your Marketing Plans?). Are LinkedIn Ads Worth The Money?